Some medications may change trace element levels in the body. Extracts of various plants, due to having the several elements, can have beneficial effects. Consumption of herbal extracts with chemical drugs may reduce adverse effects of medication. 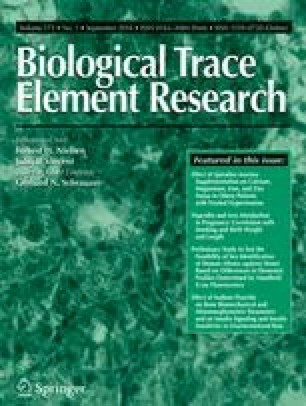 The goal of this study was to evaluate copper (Cu), zinc (Zn), and manganese (Mn) concentrations in serum of rats treated with tamoxifen, chicory, and/or milk thistle extracts. Therefore, 36 adult female Wistar rats were divided into six groups: normal control, chicory control, milk thistle control, tamoxifen, tamoxifen-chicory, and tamoxifen-milk thistle. At the end of the study, the blood samples were collected and sera isolated by centrifugation and analyzed by the atomic absorption spectrophotometry for Cu, Zn, and Mn levels. The Zn concentration increased in milk thistle-supplemented groups. The Cu level increased in the chicory control group only. Tamoxifen had no affect on Cu, Zn, and Mn levels, but seed extract of milk thistle increased Zn concentration, and chicory root extract increased Cu concentration. Although elevated levels of Cu in rats receiving tamoxifen-chicory were milder than rats treated only with chicory, it seems that the extract and tamoxifen impact on the Cu are in conflict with each other.